2018 marked the 100th Anniversary of Armistice. To pay homage to the many men and women who fell during the 1st and 2nd World Wars, Raglan Primary School have created a wonderous collection of displays paying our respects to those that gave their lives in battle. You may have seen the beautiful commemorative plaque that we have in the school with the names of the men and women who committed the ultimate sacrifice so that we could be free. 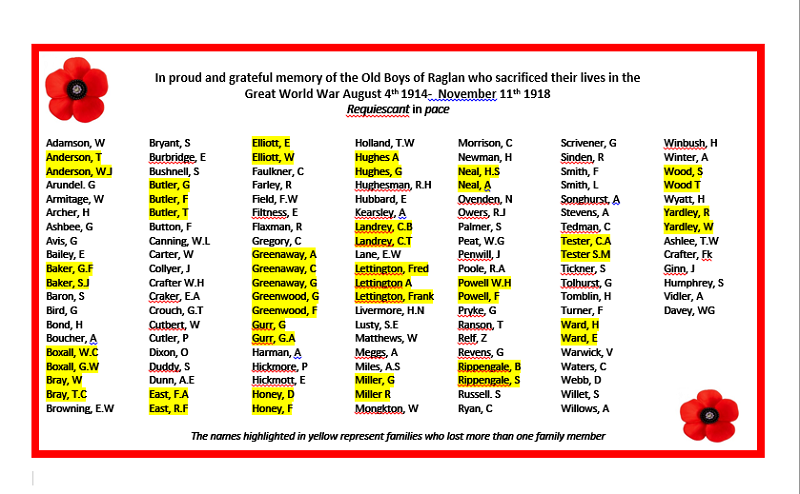 The names of these heroes have been highlighted in the list below. Please take some time to look through our gallery of images taken of our many displays throughout the school. Please click on the thumbnails for a larger view.